It’s almost that time of year again to proclaim your love to the ones you love. And wouldn’t it be nice to start their day with this lovely flatware? 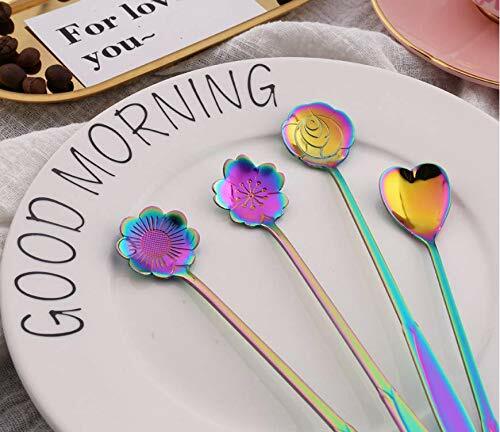 This cutlery set comes in a gorgeous rainbow finish on stainless steel. 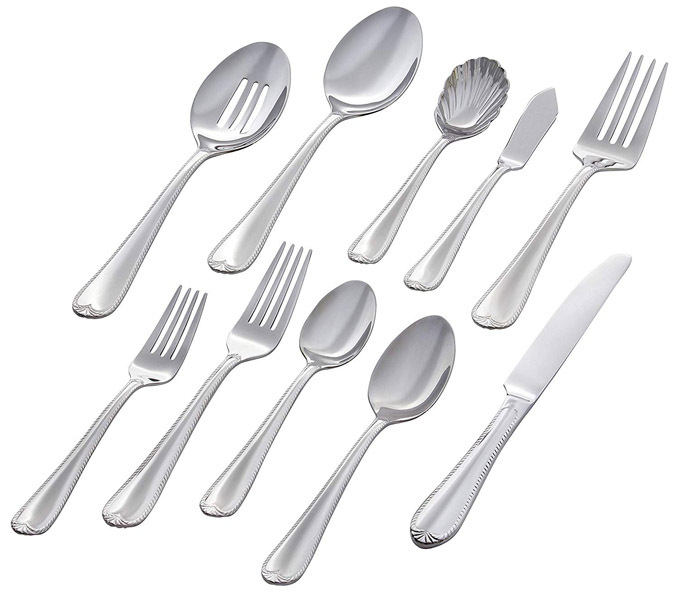 The set includes two 4 piece groups of short dessert spoons at 4.9 inches and long stirring spoons at 7 inches. The designs are from a variety of of different flower patterns: rose, coreopsis,sakura, pansy, plum blossom, platycodon grandiflorum,sunflower and heart-shaped. There has been a lot of press lately about how to communicate with your cutlery to the kitchen and serving staff at a restaurant. Supposedly the idea is that various ways of leaving the flatware on your plate will tell them how you liked your meal or whether or not you are done. In all honesty, I’m not too sure about any of this. Leaving your fork and knife in special configurations isn’t exactly the most effective way of communicating. How about you speak to the server, like a normal person? So Amazon has their own in-house decor brand called Stone & Beam. So we thought we’d check it out and this cutlery set caught our eye. It’s a great starter set for a new household and is very complete at a great price. It is made of dishwasher safe 18/10 stainless steel so it will stand up nicely. This is a full service for 12 people consisting of 12 dinner knives, spoons, forks, tea spoon, salad fork. The hostess set includes 1 each serving spoon and fork, butter knife, sugar spoon, and slotted spoon. Something about the Royal Trim flatware seems very classical. Would make a great gift or even for setting up a restaurant. The spoon rest is handy! We rarely stray from flatware into accessories but a good spoon rest when cooking at the stove is required for any good kitchen. And this one looks like it would do better than other solutions people try in my kitchen (like a paper towel that just soaked through and made a mess anyways). Tomorrow’s Kitchen Silicone Utensil Rest has many features and can handle up to four pieces of cooking cutlery at once. Made of non-slip heat safe silicone with raised notches for utensils and raised edges keep spills contained on the rest, and not on your counter top (like the paper towel idea).